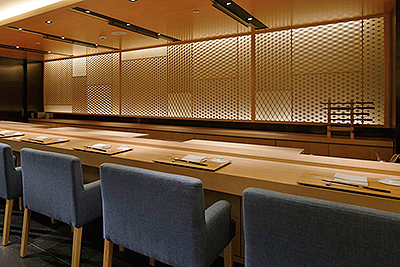 Each piece of Tanihata Brand’s Kumiko Ramma is the work of experienced craftsmanship. The “Kumiko” woodwork technique was developed in Japan in the Asuka Era (600-700 AD). Tanihata uses this technique to manufacture Ramma for room dividers and sliding doors. Wood chips are thinly and precisely shaved then carefully assembled chip by chip to construct Kumiko Ramma. Wood goes through a process of selection, grinding, splitting and assembling. Tradition is preserved through the craftsmen’s experience, skill and passion for this process. 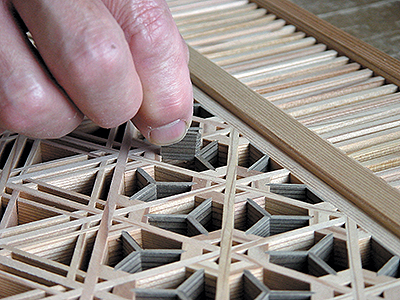 “Kumiko”, in short, is a delicate technique of assembling wooden pieces without nails. Thinly slit wooden pieces are grooved, punched and mortised, and then are assembled and joined one by one with plane, saw, chisel and other tools while fine adjustments are made. The “Kumiko” woodwork technique was developed in Japan in the Asuka Era (600-700 AD) and has since been refined and passed down through generations of craftsmen. 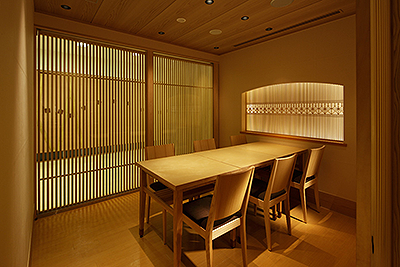 The technique of “Kumiko” is mostly found in dividers and sliding doors. One problem with the technique is that it is so sophisticated that you need a long time to master it. Besides, the change in our lifestyle to have fewer or no Japanese-style rooms in the house has led to the decrease in the number of young aspiring successors. Tanihata has been in the business of making “kumiko” woodworks since its foundation in 1959 and intends to have “kumiko” take root not only in traditional artifacts but also in modern products breaking the cultural barriers between the East and the West.